Acquired amegakaryocytic thrombocytopenic purpura (AATP) is an uncommon hematological disorder, characterized by severe thrombocytopenia and significantly decreased to absent marrow megakaryocytes in an otherwise normal bone marrow. It needs to be differentiated from the more common disorder, immune thrombocytopenic purpura (ITP), which is characterized by normal-to-hypercellular bone marrow. The thrombocytopenia in ITP is caused by peripheral destruction of platelets. Usually, AATP is suspected when a patient with thrombocytopenia does not respond to steroid therapy. AATP can be associated with significant bleeding tendencies. It is postulated that both humoral and cell-mediated immunity play a role in the suppression of megakaryopoiesis in AATP., Thrombopoietin receptor antibodies were found in patients with AATP. AATP can progress to aplastic anemia or myelodysplastic syndrome (MDS). It is also said to be associated with several rheumatological and hematological conditions. A 63-year-old woman was admitted with a history of spontaneous bruises and rashes for 1 month, increasing in severity for the past 1 week. She had no history of fever, dark-colored urine, malena, hematemesis or hemoptysis. Past history was insignificant, except that she was on herbal medicines for constipation, for 2 months. On clinical examination, she was afebrile, pale and had purpuric rashes over the face, upper limbs, and lower limbs. Complete blood count showed anemia (Hemoglobin (Hb): 10.3 gm/dL, normal range: 12”16 gm/dl) and low platelet count (10,000/c mm, normal range: 1.5”4.5 lakh/c mm). 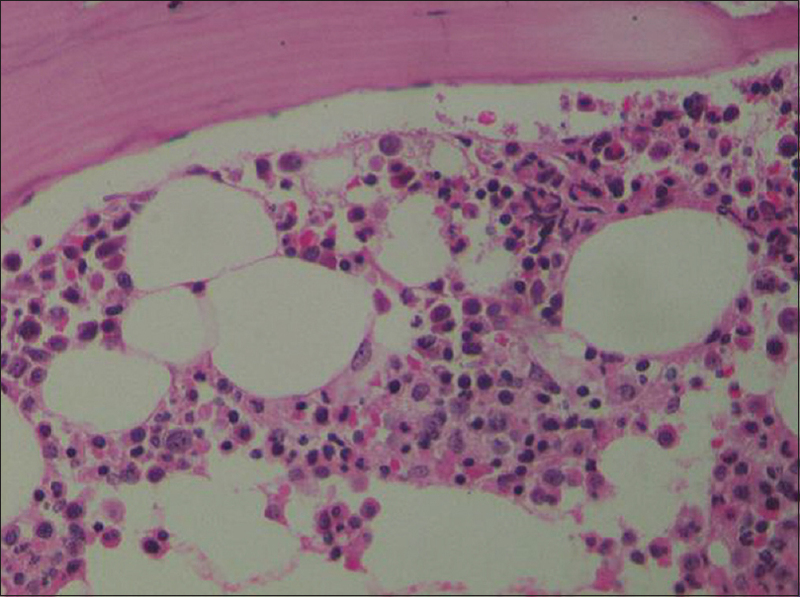 Bone marrow study showed absent megakaryocytes [Figure 1] and [Figure 2]. Therefore, a diagnosis of AATP was made. She was put on oral cyclosporine. Blood sugar and pressure were closely monitored. Vitamin B12 supplements were administered in view of B12 deficiency (87 ng/L, normal range: 206”678 ng/L) found as a part of the work up. Serum lactate dehydrogenase (LDH) was within normal range. She was worked up for autoimmune causes and hematological malignancies, as megakaryocytic aplasia usually accompanies these disorders. Anti nuclear antibody(ANA), anti double stranded DNA (anti-ds DNA) and anti neutrophil cytoplasmic antibody (ANCA) were negative. Bone marrow aspirate for Myelodysplastic syndrome panel (5q del, 7q del, trisomy 8, 20q del) was negative. Computed tomography of chest and abdomen did not show any significant abnormality. Cyclosporine blood levels were maintained within therapeutic range. She was discharged on oral cyclosporine 150 mg twice daily and oral prednisolone 60 mg/day (1 mg/kg/day), along with Vitamin B12 supplements. The platelet counts continued to be stable at 10 months of follow-up (platelet count: 40,000/c mm). Our patient was initially started on high-dose steroids on suspicion of ITP. However, the complete absence of megakaryocytes in bone marrow ruled out the possibility of ITP, and she was diagnosed with AATP. AATP is a rare condition. It is essential to rule out other conditions presenting with acquired thrombocytopenia. Proper clinical examination is required to find out lymphadenopathy, hepatomegaly and splenomegaly. Peripheral blood smear examination must be done in all cases of thrombocytopenia. A low platelet count falsely occurs with platelet clumping. Peripheral blood smear is also useful in diagnosing conditions such as leukemia and thrombotic microangiopathies [Thrombotic thrombocytopenic purpura (TTP), Hemolytic uremic syndrome (HUS)]. The association between consumption of herbal medicine and AATP is unknown. It is difficult to determine whether it is a true association or a mere coincidence in our patient. It has been reported that AATP occurred after injecting percutaneous ethanol for hepatocellular carcinoma. Occupational chemical exposure can lead to AATP. 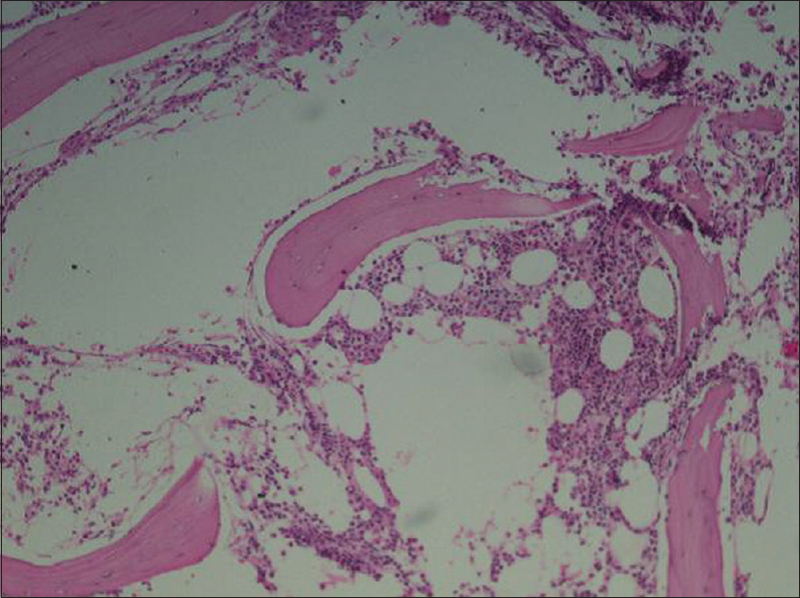 Vitamin B12 level was low in our patient; however, bone marrow did not show megaloblastic changes. Various conditions are associated with AATP like vitamin B12 deficiency, systemic lupus erythematosus (SLE), parvovirus B19 infection, non-Hodgkin's lymphoma, thymoma, and MDS.,,,,, Autoimmune condition SLE was ruled out in our patient, as she had no signs and symptoms of SLE and serological markers (ANA, anti-dsDNA) were negative. Imaging of chest and abdomen are required to find out mediastinal and/or abdominal lymphadenopathy that occurs in lymphoma. Non-Hodgkin's lymphoma, in particular, large granular lymphocytic lymphoma is associated with AATP. In our patient, serum LDH level was within normal range. Computed tomography (CT) of chest and abdomen did not show any lymphadenopathy or hepatosplenomegaly. AATP can be an initial presentation of MDS, and all patients need to undergo MDS cytogenetics panel, including 5q del, 7q del, 20q del and trisomy 8. Amegakaryocytic thrombocytopenia can progress to MDS or aplastic anemia., These patients need to be followed up to monitor the development of these conditions. Apart from hematological conditions, lung cancer presenting as AATP has been reported in literature. Various treatment options are available for the treatment of AATP. As it is a rare condition, most of the available information is based on individual case reports. Treatment usually depends on the availability, cost factors, and side effects of drugs. There is no fixed treatment available for this condition. However, it is advisable to start with least toxic and cost-effective therapy. Periodic monitoring of treatment response is essential. Treatment failure requires change of therapy. Both cell-mediated immunity and humoral immunity plays a role in causation of this condition. Immunosuppressive agents have a role in treating this condition. Available pharmacological therapies such as steroids, androgens, antithymocyte globulin (ATG), cyclophosphamide, cyclosporine A, and immunoglobulins have shown varying degrees of response. Cyclosporine alone, or in combination with ATG, is said to be effective in treating this condition. Platelet count improved with cyclosporine in our patient. Side effects such as hyperglycemia and hypertension should be monitored properly. Other treatment options like rituximab, danazol, azathioprine, and romiplostim have been reported in various case reports.,,, Myeloablation followed by bone marrow transplant can be done in refractory cases. Bone marrow transplant is not a suitable option in the elderly. It is a better option in refractory young patients. Confirmed AATP must be further worked up for secondary causes, such as vitamin B12 deficiency, parvovirus infection, lymphoma, thymoma, and MDS. Usual regimens effective in ITP are not effective in AATP. AATP can progress to aplastic anemia and complete bone marrow failure requiring transplant. Hoffman R. Acquired pure amegakaryocytic thrombocytopenic purpura. Semin Hematol 1991;28:303-12. Benedetti F, de Sabata D, Perona G. T suppressor activated lymphocytes (CD8+/DR+) inhibit megakaryocyte progenitor cell differentiation in a case of acquired amegakaryocytic thrombocytopenic purpura. Stem Cells 1994;12:205-13. Katai M, Aizawa T, Ohara N, Hiramatsu K, Hashizume K, Yamada T, et al. Acquired amegakaryocytic thrombocytopenic purpura with humoral inhibitory factor for megakaryocyte colony formation. Intern Med 1994;33:147-9. Katsumata Y, Suzuki T, Kuwana M, Hattori Y, Akizuki S, Sugiura H, et al. Anti-c-Mpl (thrombopoietin receptor) autoantibody-induced amegakaryocytic thrombocytopenia in a patient with systemic sclerosis. Arthritis Rheum 2003;48:1647-51. Ai DL, Li BT, Peng XM, Zhang LZ, Wang JY, Zhao Y, et al. Acquired amegakaryocytic thrombocytopenic purpura induced by percutaneous ethanol injection during treatment of hepatocellular carcinoma: A case report. Oncol Lett 2016;11:798-800. Patel M, Kalra A, Surapaneni R, Schwarting R, Devereux L. Acquired amegakaryocytic thrombocytopenia in a patient with occupational chemical exposure. Am J Ther 2014;21:e17-20. Ghos K, Sarode R, Verma N. Amegakaryocytic thrombocytopenia of nutritional vitamin B12 deficiency. Trop Geogr Med 1988;40:158-60. Fukushima T, Dong L, Sakai T, Sawaki T, Miki M, Tanaka M, et al. Successful treatment of amegakaryocytic thrombocytopenia with anti-CD20 antibody (rituximab) in a patient with systemic lupus erythematosus. Lupus 2008;17:210-4. Bhattacharyya J, Kumar R, Tyagi S, Kishore J, Mahapatra M, Choudhry VP. Human parvovirus B19-induced acquired pure amegakaryocytic thrombocytopenia. Br J Haematol 2005;128:128-9. Lugassy G. Non-Hodgkin's lymphoma presenting with amegakaryocytic thrombocytopenic purpura. Ann Hematol 1996;73:41-2. Maslovsky I, Gefel D, Uriev L, Ben Dor D, Lugassy D. Malignant thymoma complicated by amegakaryocytic thrombocytopenic purpura. Eur J Intern Med 2005;16:523-4. Erkurt MA, Kaya E, Baran M, Yitmen E, Fienel S, Kuku L, et al. Rapid progression of acquired amegakaryocytic thrombocytopenia to myelodysplastic syndrome: Case report. Turk J Haematol 2005;22:205-8. Lai DW, Loughran TP Jr, Maciejewski JP, Sasu S, Song SX, Epling-Burnette PK, et al. Acquired amegakaryocytic thrombocytopenia and pure red cell aplasia associated with an occult large granular lymphocyte leukemia. Leuk Res 2008;32:823-7. King JA, Elkhalifa MY, Latour LF. Rapid progression of acquired amegakaryocytic thrombocytopenia to aplastic anemia. South Med J 1997;90:91-4. Witteles WH, Schrier SL, Wakelee HA. Lung cancer presenting with amegakaryocytic thrombocytopenia. J Clin Oncol 2008;26:1171-4. Tristano AG. Acquired amegakaryocytic thrombocytopenic purpura: Review of a not very well-defined disorder. Eur J Intern Med 2005;16:477-81. Niparuck P, Atichartakarn V, Chuncharunee S. Successful treatment of acquired amegakaryocytic thrombocytopenic purpura refractory to corticosteroids and intravenous immunoglobulin with antithymocyte globulin and cyclosporin. Int J Hematol 2008;88:223-6. Hashimoto A, Fujimi A, Kanisawa Y, Matsuno T, Okuda T, Minami S, et al. Successful rituximab treatment for acquired amegakaryocytic thrombocytopenic purpura complicated with Coombs-negative autoimmune hemolyticanemia. Rinsho Ketsueki 2013;54:568-73. Mulroy E, Gleeson S, Chiruka S. Danazol: An effective option in acquired amegakaryocytic thrombocytopaenic purpura. Case Rep Hematol 2015;2015:171253. Chang H, Tang TC. Successful treatment of amegakaryocytic thrombocytopenia with azathioprine. Acta Haematol 2011;126:135-7. Shigekiyo T, Sekimoto E, Shibata H, Ozaki S, Fujinaga H, Hirose T. Treatment of acquired amegakaryocytic thrombocytopenic purpura with romiplostim. Platelets 2015;26:504-6. Lonial S, Bilodeau PA, Langston AA, Lewis C, Mossavi-Sai S, Holden JT, et al. Acquired amegakaryocytic thrombocytopenia treated with allogeneic BMT: A case report and review of the literature. Bone Marrow Transplant 1999;24:1337-41.